No matter which industry you are working in, and at what position, productivity is the ultimate key to achieve success, even more so, for the accounting industry. A productive accountant completes the tasks before time and has the capability to do more. However, productivity does not essentially mean working 24/7. On the contrary, a productive accountant is good at keeping a work-life balance. It is no mystery that the CPAs and other accounting professionals have to work day in and day out to fulfill the client’s requirements. Hence, to be on top of their game, they have to keep a balanced work process without stressing their mental faculties. 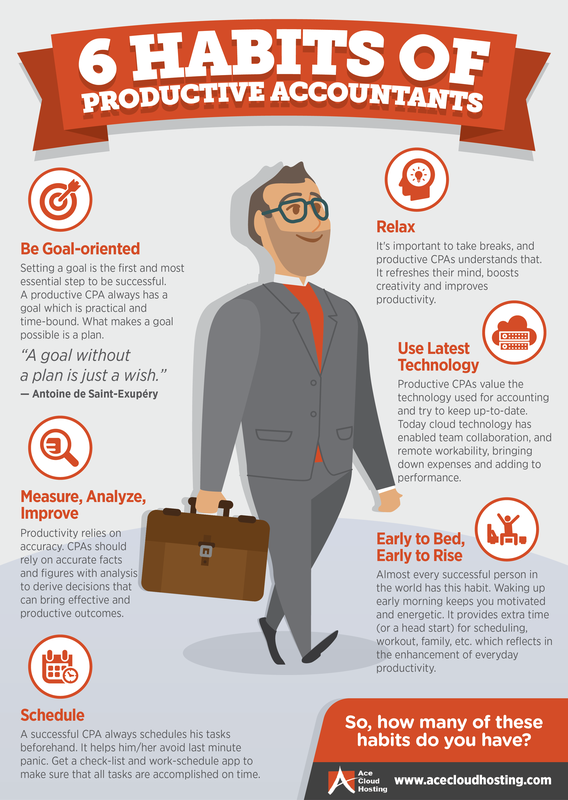 Here is an infographic depicting the six habits that every accountant must imbibe to lead a productive lifestyle. Let’s explore these in detail. As a CPA, you should set goals in accordance with the tasks at hand. The goals should be realistic and not at all a reason for mental stress. The goals can be set on a monthly as well as a daily basis. Once you set these goals, you must plan how to accomplish them. Goals help you analyze whether you are on track or lagging behind. No process can be carried out efficiently without the proper analysis. For CPAs, the facts and figures regarding the business of each client are vital to evaluate taxes, keep track of payments, and maintain proper balance sheets. Once the data is collected and analyzed properly, the CPAs can get a clear picture of the business process. Scheduling the tasks is very important for CPAs as it helps in time management and reduces the mental stress of last-minute panic. Once you know what-to-do, how-to-do, and when-to-do, the tasks become easily manageable. Scheduling helps you to complete tasks in a pre-defined time frame. You can use the various work schedule apps such as Trello, Evernote, etc. available in the market to streamline your process. You can make use of a checklist to keep the status of your tasks up-to-date. No matter how busy you are with your work, there is always time to relax. Taking short breaks every hour reduces mental stress and relaxes the mind and body. You can do exercises, interact with family, have a cup of coffee, and meditate, among other activities. Relaxing at fixed intervals refreshes the mind, boosts creativity, and improves productivity. The productive CPAs understand the impact of relaxation on the mind and implement the same in the day-to-day operations. Technology is the CPAs’ primary aid when it comes to accounting operations. Technologies such as cloud and the various accounting software available in the market such as QuickBooks helps the CPAs to achieve their goals swiftly and efficiently. For instance, desktop application hosting enables team collaboration, and remote workability in the accounting process improving performance and saving revenue. One of the oldest saying, and one of the most accurate. Having a good night’s sleep keeps you active all day long. The CPAs should follow this routine of sleeping early at night and waking up early in the morning. Waking up early in the morning keeps you motivated, and you have extra time for the workout, family, as well as planning your day. As a CPA, I always thought of taking breaks as wastage of time. However, reading your blog made me realize how important it is to take breaks, no matter how short they are. I believe that these points should be obeyed by anyone who wants to be more productive. All aspects are apt and totally on point.